We are a little bit obsessed with Pinterest. Ever since we received our invite to join the image based social media site in the beginning of 2012 we have been addicted to trawling the internet, finding great images to ‘pin’ to our boards and repinning things that others have found too. Our boards have quickly grown from a few to quite a lot and even the wee hours have found us adding new, lovely images to our collections. Not quite sure what Pinterest is? Here is a very quick introduction. In principle, Pinterest is a bit of a mash up of Twitter and Instagram with a bit of Facebook thrown in for good measure. You create a profile, then create personally titled ‘boards’, to which you can virtually pin images you have found either on the web (though a special ‘pin it’ button you can load onto your bookmark bar), or through looking at other peoples boards (a bit like re-tweeting), or just through browsing certain topics and keywords on the main Pinterest site, via organised categories. What is great is that the original source of the image is embedded in the ‘pin’ so when the image is clicked it takes the viewer back to the original website. Really, you are creating completely virtual collections and scrapbooks of great images under titled boards that everyone can see, with links back to where you found them. You can follow people. They can follow you back. You can follow just specific boards of any user. You can comment on any image and like it – just like Facebook. You can also send links from Pinterest to the other social media platforms. Lovely. A brilliant way to spend a few hours, but as a designer or design studio what is the value? We think it is absolutely huge – think about it – anyone can see the exact images that you get excited about. Things that inspire you. Things that you have designed and made. In such a visual vocation as design, surely there cannot be many social media platforms better equipped to simply and quickly showcase who you are, what you do and what you stand for as a designer, a studio or a ‘brand’? Potential clients can look at your Pinterest boards and get a pretty good idea if you would be able to translate the images in their mind into the space or product of their dreams. They could also glean your general sense of humour and get a feel of how easy you would be to work with. Your Pinterest account becomes a set of mood boards specific to you, but open for the whole world to see, like and comment upon. And whilst we are on the subject of mood boards, we have used our Pinterest account to work communicate completely virtually with a few sets of clients – and all with great success. 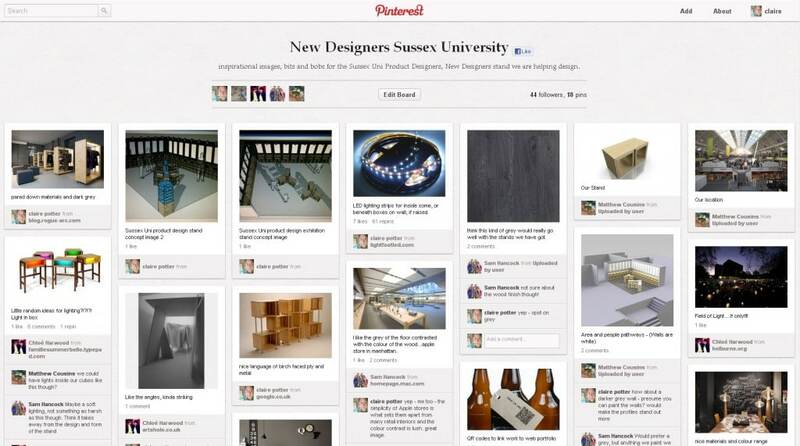 When we were working with the students at Sussex University to help them design their New Designers exhibition stand, we created a board on our account specifically for the project, then invited the students who were also members to become ‘additional pinners’ allowed to pin to our boards. So we could pin inspirational images to the board and they could see and comment on them. Or if they found something interesting, they could pin it to the same board and the studio could comment on it. It completely removed the need for printing mood boards, having meetings, noting down the comments and revising the images – we did it all through Pinterest – quickly and virtually. Of course, everyone else in the world could see them too, but as it was not too sensitive a project privacy wise, this was a much more efficient way to work. But, Pinterest have very recently launched a very exciting feature with their new ‘secret boards’, With this new feature you can collate and share boards with only your invited guests, making it perfect to share items with clients quickly, making the initial design conversations extremely efficient – no travel, no printing, no fuss. A shared link and a conversation on the phone to save everyone’s time. This of course will never replace client / designer meetings with the traditional mood board and will be more relevant for some projects more than others, but the ease of communication allowed with the Pinterest boards is extremely exciting.